Born 1935, Holly Creek, Kentucky lives in Campton, Wolfe County, Kentucky. Earnest Patton is counted among the notable Campton School of carvers which includes Edgar Tolson. 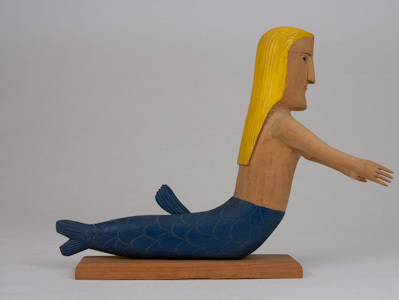 Considered a master carver, Patton's work has been displayed in many exhibitions and his work appears infrequently in folk art auctions of seminal collectors. 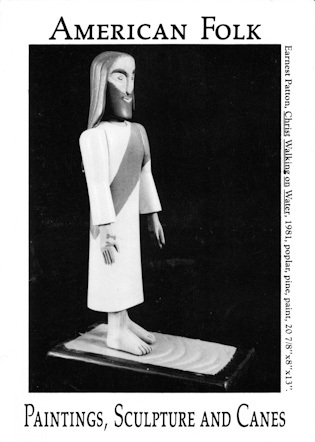 Among the shows in which his work has been included was "Generations of Kentucky" a traveling show which also included black and white photographs of the exhibiting folk artists in familiar environments by Guy Mendes. 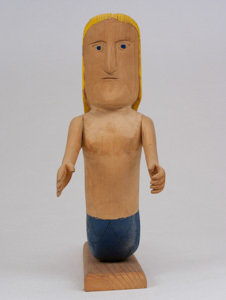 The show's itinerary spanned over a year's time and was displayed in five notable sites in Kentucky as well as the Ohio Craft Museum in Columbus, Ohio. Patton's carvings, which resemble the Tolson's stylistically and technically, are from linwood as well as poplar and are painted with machinery paint. His subject matter often includes folk heroes and religious, or historic figures such as Daniel Boone or Abraham Lincoln. 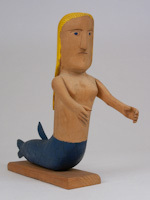 The singular piece of Patton's work we have in our collection is a well proportioned blond mermaid. 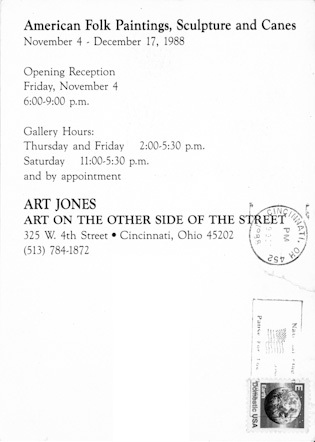 It was consigned to Art Jones Gallery by Larry Hackley at the time of our purchase in 1988. It's carved date and signature read: 4.6.1987 Earnest Patton.